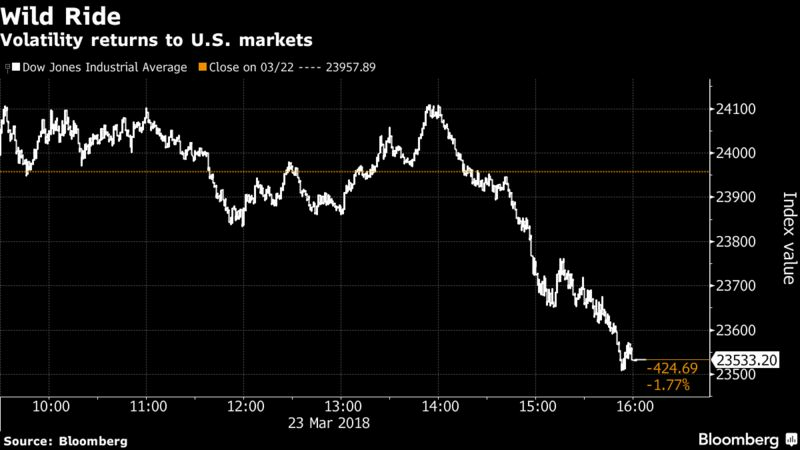 U.S. stocks tumbled, sending the S&P 500 Index to its biggest weekly loss in more than two years, on concern that a trade war and higher borrowing rates could throttle global growth. Oil surged on speculation sanctions on Iran will be re-imposed. The Dow Jones Industrial Average slumped to the lowest since November, led by losses Friday in companies as diverse as 3M Co. to Goldman Sachs Group Inc. The S&P 500 dropped to its least since the volatility-fueled meltdown in early February. Gold rallied and Treasury yields declined as investors sought safe havens. It’s been a miserable week for higher-risk markets globally, as a trade war edged closer, the tech sector was roiled by Facebook Inc.’s privacy scandal and data showed European growth sputtering. The tech heavy Nasdaq 100 dropped 7.3 percent this week, the most since 2015. Traders had already been bracing for the possibility of slowing expansion as the Federal Reserve reiterated its commitment to further interest-rate increases after Wednesday’s hike. The S&P 500 Index dropped 2.1 percent to 2,588.24 as of 4:02 p.m. New York time, while the Dow Jones Industrial Average slumped 1.8 percent to 23,532.30 and the Nasdaq Composite Index dropped 2.4 percent to 6,992.67. On the week, the S&P 500 tumbled 5.9 percent, the Dow dropped 5.7 percent and the Nasdaq slumped 6.5 percent. The Stoxx Europe 600 Index fell 0.9 percent and the MSCI Asia Pacific Index tumbled 2.6 percent. The U.K.’s FTSE 100 Index slipped 0.4 percent, after touching the lowest in more than 15 months. The MSCI Emerging Market Index fell 2 percent. The euro rose 0.5 percent to $1.2362, the strongest in more than a week. The British pound increased 0.3 percent to $1.4137. The Japanese yen advanced 0.5 percent to 104.78 per dollar, the strongest in more than 16 months. Germany’s 10-year yield was little changed at 0.53 percent. Britain’s 10-year yield gained one basis points to 1.44 percent. West Texas Intermediate crude increased 2.5 percent to $65.89 a barrel. Gold increased 1.4 percent to $1,348.21 an ounce, the highest in more than a month.